Learn English with the world’s leading experts, British Council in Sri lanka operating with 3 Branches in Colombo, Kandy and Jaffna. 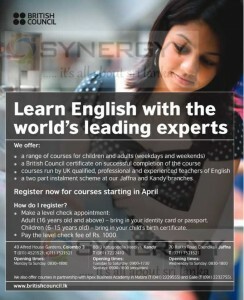 British Council do their best service to teach English with professional and experience English teachers. a two part instalment scheme at our Jaffna and Kandy branches. Adult (16 years old and above) – bring in your identity card or passport. Children (6-15 years old) – bring in your child’s birth certificate. Pay the level check fee of Rs. 1000. I’m Ms.J.Rajamalligai.I’m working at Prime Minister’s Office as an Assistant Secretary.I would like to study a spoken English course in British Council.Please I kindly request that you register me for the course.thank you.